At Home with God started life twenty-seven years ago. It began around a kitchen table, as a quiet journey of family discipleship, written by a mum who wanted to pass on her faith to her four small children. The material Becky wrote developed into At Home with God, a collection of simple family liturgy: prayers, bible readings, discussion prompts, as well as ideas for celebrating life together and building family traditions around the seasons and Christian festivals. Its intention is to help families on their discipleship journey together: by interweaving the spiritual with the ordinary, dispelling the fear of the spiritual and bringing the wonder back into the ordinary; by saying that faith is lived out daily in all the business of being a family; that the stuff of life is worth celebrating, that people are worth loving, that the Bible is the best book in the world and that prayer is natural and good and worth doing together. Becky's children are all grown up now, and following Christ for themselves. And so, four weddings and seven grandchildren later, there is a new generation. 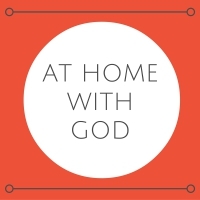 The legacy of At Home with God lives on, and begins again around a few more kitchen tables. As a growing family of in-laws, aunties, uncles, grannies, granddads, cousins and siblings, we are delving back into Becky's writings and using them with our own children, reflecting on our own experiences as we go. On this website, you will find all the material you need to join us if you wish, as well as some of our ramblings and pictures of life, lived along the way. All of Becky's original material is available to download free from this website , to be used around kitchen tables wherever they may be.